'Peacock Point', the Henry P. Davison estate designed by Walker & Gillette c. 1914 in Lattingtown. Click HERE, HERE and HERE for more on 'Peacock Point'. 1) The loggia has been enclosed. 2) The cherub statues have been rotated from facing each other to looking down the back of the house. I would have rotated them the other direction -- I don't like those buggers looking at me. I've always loved this place. SPLENDID !!! I would love to have been able to look through that telescope at the water craft on Long Island Sound. And, by the way, Putti are alwways a welcomed sight no matter which way they face ! Really lovely shot. 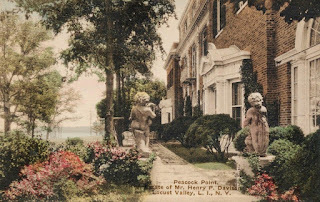 Of course, I never fail to be hornswoggled that people used to so willingly allow their houses to be the subject of postcards sold at the corner drug store.